There isn't anyone that I know of that has comprehensive scientific data on the vacuum situation with a specific set up in the Pantera. What we have is a independent runner manifold. It has no common plenum and it gets set up as such. I think it is safe to speculate that it came to be for racing purposes and that it is doubtful that an engine generated vacuum source was a significant consideration. When I got my first manifold from Gary Hall in about 1978, it had one port drilled and threaded into the #8 runner on the manifold. As I remember, it was a 3/8npt port. When I asked Gary, he said, "oh yea, that's where you connect the vacuum hose for the power brakes. The vacuum from one runner is enough." We all are stating our own experiences with this system. I as well as others have noticed that there seems to be noticeable differences in results and issues. I am not criticizing others experiences. I'm comparing notes, so to speak? Halls solution didn't work for me. That first set up was in my 68 GT350 and if I tell you that I was walking the high wire without a net by myself, that is an understatement. I plugged the thing and went on to making it run on the car. That set up eventually got traded away when I went back to the original 302 in that car...sort of...but that's an entirely different story and not for now. Webers can be an addiction. Maybe more accurately an infection like Malaria. You think you are over it, then out of nowhere, you get a reoccurrence? Well, my way of dealing with that was to install them on my Pantera. The difference was that no longer was I using the iron 4v heads, now I had these nice race car set up A3 aluminum heads. The fever was getting worse. So back to Hall for a manifold. This time with no predrilled vacuum ports. Yada, yada, yada. Fast forward. I need engine vacuum connections. So here's the thing, not lots of room for intricate vacuum plumbing. Halls design didn't work. Wouldn't it be great to have a vacuum gauge in the car to add more info to exactly WTF was going on back there? Sure. 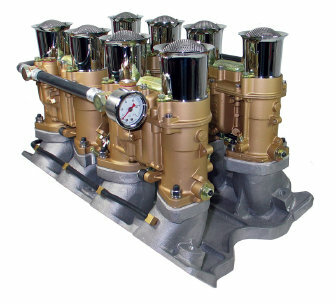 This is an IR manifold. Carbs are calibrated (tuned) to operate under IR conditions. Question: how large do the vacuum lines need to be from runner to runner BEFORE they become balance tubes and create a central plenum in the manifold? Question: what happens if too large a tube system is installed? Answer: you probably screwed up the entire physics of the design and will have no choice then to go back to where you started. This is 2300cfm of carbs. You can't use that much on a center plenum manifold. At SOME UNKNOWN POINT connecting the runners together convert the manifold into a center plenum manifold. Who finances that experiment? You only get two weeks for vacation. Don't you want to go to the beach? Question: what happens to the holes that you drilled into the manifold for the larger fittings? Answer: weld them up or get another new manifold. They're only $900. All I can say is that my vacuum tube system works for attaching a vacuum gauge. Works great. Does it supply enough vacuum to work the brakes? Solution: rather then destroy the manifold, screw that idea and just go to a vacuum pump. Answer: done. Pump is noisy but gets lost in the noise of the solid lifter cam and 180 headers. No one notices it. Air cleaners: I'm not sure if even with a "Weber" cam, if it is safe to run any kind of an air filter over these volcanoes? The picture I posted is of lets say "the pre-installation engineering study". Yea, that's it. That's what I'll call it. MPG: Well this is a little difficult to nail down scientifically. For one thing, it is as difficult to keep your foot out of the accelerator as it is for Dr.Strangelove to control his repatriated right hand. In my experience, with a 140f/160a F5 with .70/1.20 idle and 42mm chokes (auxiliary venturi) expect about 17 mpg beating the thing like you stole it, about 22 on a long cruise like to a Shelby Convention about 15 hours away. By comparison, the Holley 4179, 750cfm "double-pumper" is as rich at idle as the Webers are, and never got more then about 12. Mileage is relative to what you expect out of all the parameters. ONE little detail that I absolutely stumbled across that is a big factor is that the fuel cloud at WOT "hovers" over the stock height stack. IF you extend those stacks to 5" high, the vapor cloud stays within the stacks. The Pantera is one of the few cars that can be done on and still be within the "engine confines". IF you look at period photos of any of the Grp4 factory cars, you will notice now (now that I told you what to look for) the stacks have been extended to about 5" high. Coincidence? Maybe? Sure. Everything is just coincidence right? This is ONLY effective on the Pantera. It's the only car that has this room over the top of the manifold. The Mustangs don't. This is what Inglese did on a Pantera Weber set up. He used rubber hoses. Small ones. I think this one has a vacuum plenum added to it in between the carbs in the back? In my experience, not enough to work the brakes.